When Abdullah Mohammed was on his daily routine in M+W office, on 12th Jun 2015 he suddenly collapsed and his colleagues helped to take him to the hospital nearby. It was a major cardiac attack and he had to be taken to Frontier Lifeline hospital, Chennai. Next day, when his parents reach to Chennai from Guntur, they were told that it was coronary artery disease and had to be hospitalized. Since then his life is never the same with growing complications. 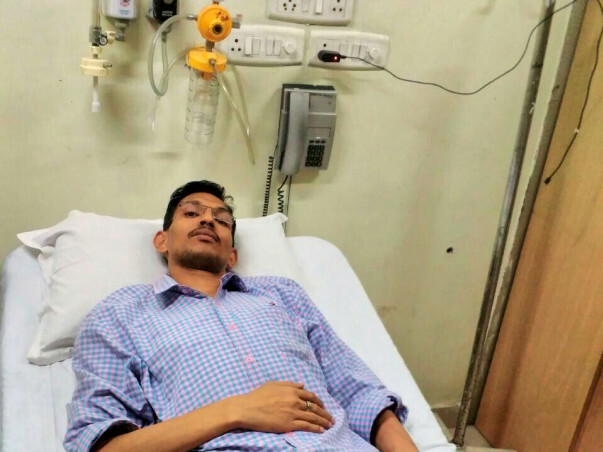 He had to get admitted in local hospital and then in Ramesh Hospital, Vijayawada, who asked to take him to Hyderabad as the condition was critical. 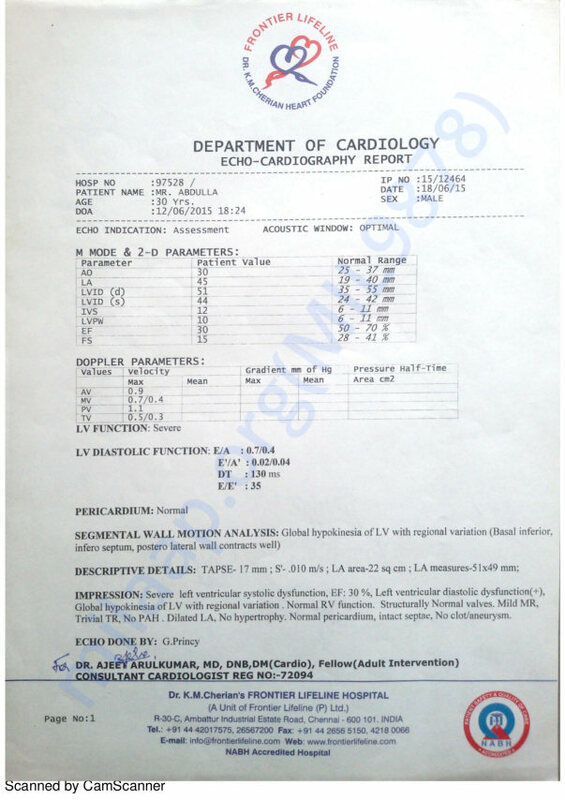 Till September 2016, he was withstanding with the device with average daily routines but from September onward, again started suffering from severe Cardiac illness & breathing problem and doctor advised to get admit. 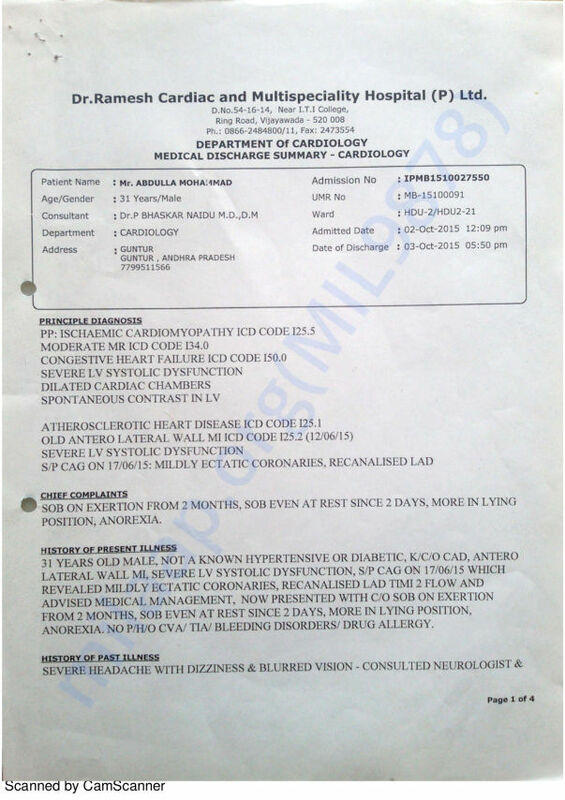 He was admitted in CARE Hospital resulting in diagnosing different tests and doctors confirmed in Oct 2016 to get Heart transplantation done as soon as possible. This is estimated to be Rs. 22 lakhs. Though he is on minimal daily activities since last 2.5 months, he had to be hospitalized for Dobutamine (drug used in the treatment of heart failure) drip in ICU multiple times. As he has availed the Chief Minister Relief fund earlier for pacemaker , it is not yet considered for the subsequent financial aid by the AP government despite multiple requests since last one month. Till now they spent a lot of money and gone through many tests and a surgery. Now they are not in a position to bear the cost of heart transplantation. He has been registered in Jeevandaan and awaiting for the donor's heart. As the transplant is not a time bound surgery, rather on availability of the donor heart, funds are needed urgently to ensure the availability of funds in case of donor heart is available. Here is where Abdullah and his family need our support. Abdullah's HEART TRANSPLANT SURGERY went on well by the Grace of Almighty and the prayers by all. 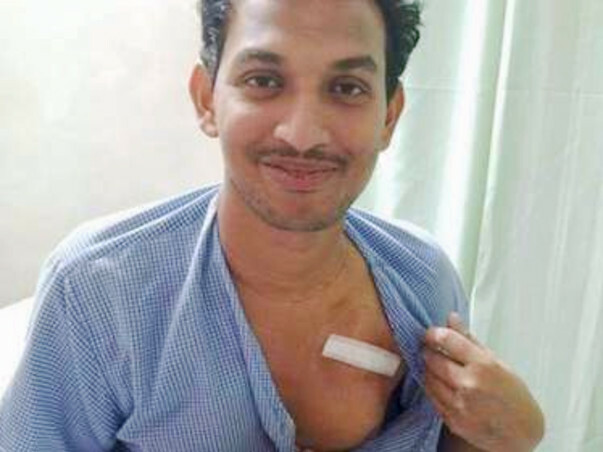 He was under observation and close monitoring of doctors in CARE HOSPITAL, Ramnagar, VISAKHAPATNAM till yesterday. He will be shifter to ICU today(30th Mar 2017). 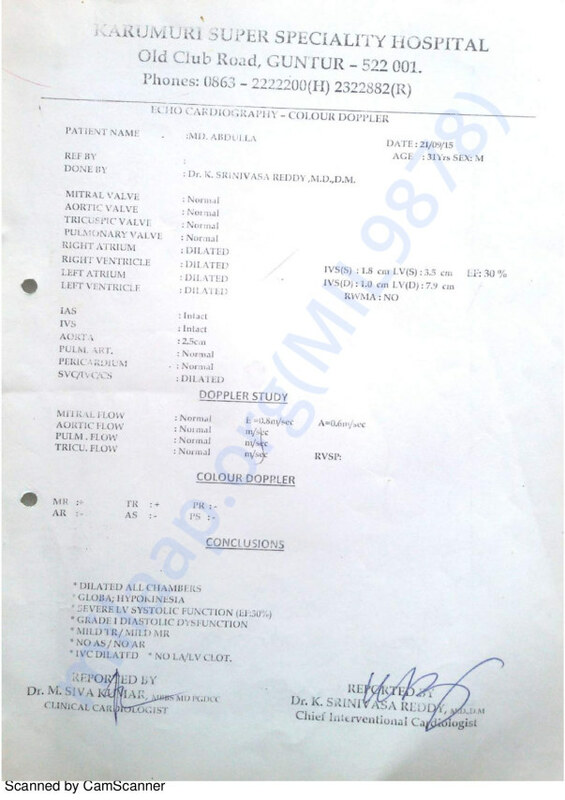 His discharge date is not yet intimated by doctors. Will update you further. Final payment amount is yet to know. Please continue support Abdullah. Here is an update on Abdullah's case. Received a call from Jeevandaan at 07:30PM on 20the Mar 2017 informing that the organ is available and asked to come to the Care Banjara hospital immediately. The donor is in Appollo hospital Visakhapatnam. 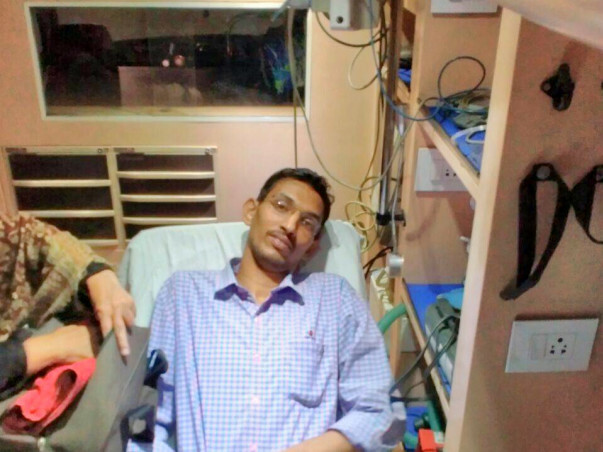 Initial plan of the doctors was to get the organ from Vizag by air. But doctors decided to send Abdullah to Vizag immediately. As there were no flights available, he had to fly by special flight. 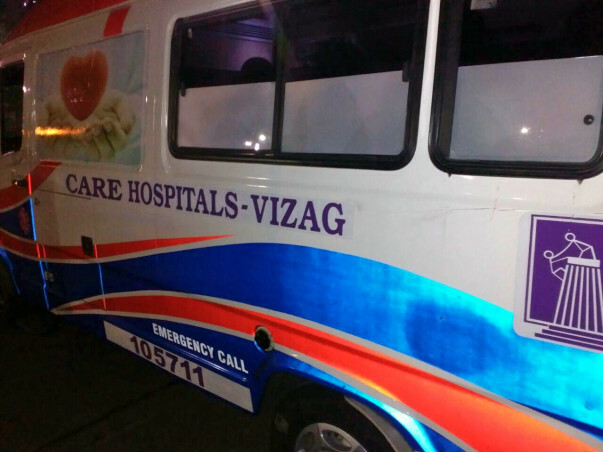 By 10:30 PM they started from hospital and reached Vizag Care (Ramnagar Branch) by 12: 30 Midnight. The procedure will be started in some time from now. Sharing few photos received from Vizag. Please pray for his successful surgery. Also please do support Abdullah and share this link with your friends. Flight cost is around 5 lakh which is an additional and unexpected expense for Abdullah's family. One additional update is 2.5 lakes was sanctioned by CM relief fund. However, he still need our support. You can reach out to me on mail is: owaiseaw@gmail.com for any queries or contact numbers. I thank you all for your wonderful support for Abdullah ! May your thoughts and prayers continue to be with him. 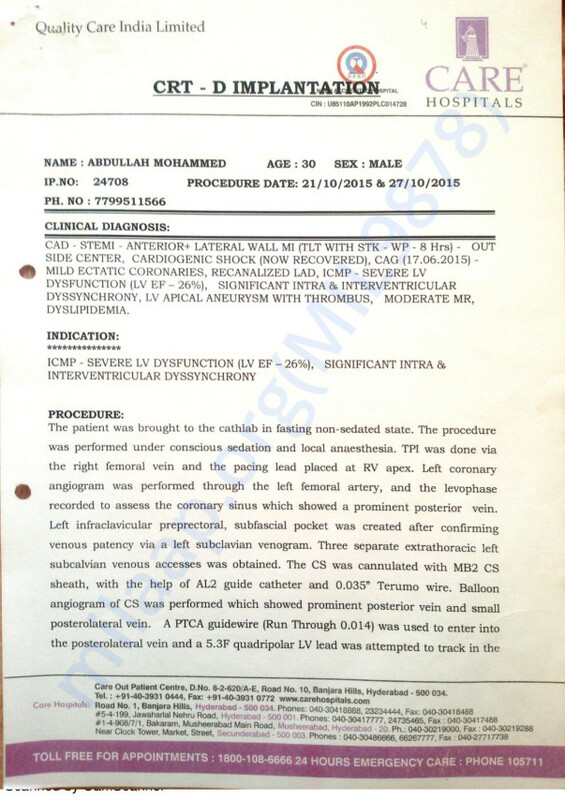 The latest update on Abdullah is he fell ill last week and was hospitalisbecause of severe weakness. 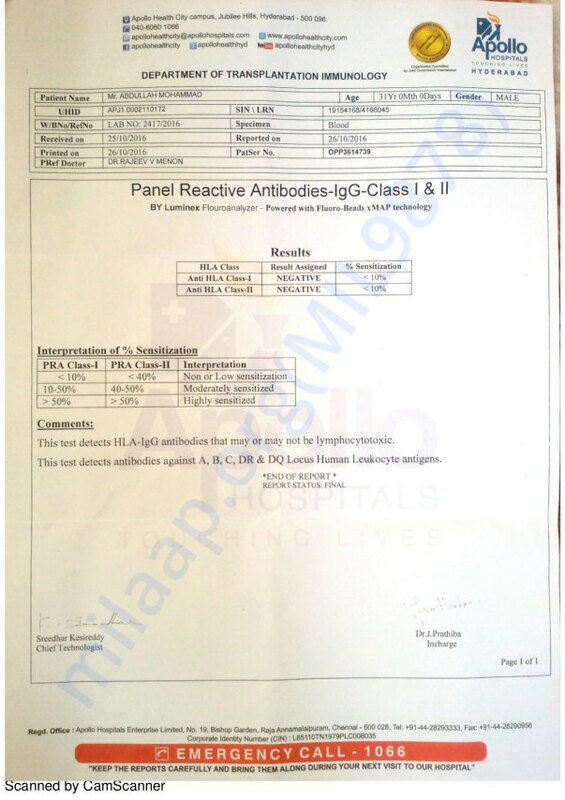 CT scan found no major aiments. Doctors changed the medicarion for blood thinning. He is now discharged. He is waiting for the donor orgàn.